This is a Civil Defense message for 4 p.m. Tuesday, May 1, 2018. Hawaiian Volcanoes Observatories and your Hawaii County Civil Defense will continuing to monitor the situation throughout the night. You will be informed as conditions change. Thank you for listening. This is your Hawai’i County Civil Defense Agency. 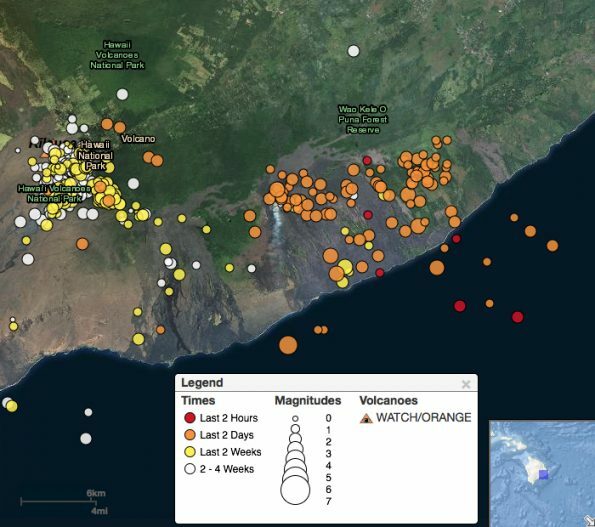 The collapse of the Puʻu ʻŌʻō crater floor on Kīlauea Volcano’s East Rift Zone has triggered increases in earthquake activity and deformation along a large section of the rift zone, according to Christina Neal, scientist-in-charge at Hawaiian Volcano Observatory (HVO). 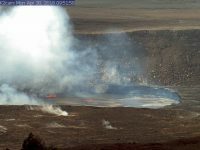 Meanwhile, the County has closed the Kalapana lava viewing area amid the possibility of an eruption, and security has been posted to ensure that no unauthorized persons enter the area. A magnitude 4.0 earthquake just offshore of Puʻu ʻŌʻō occurred at 2:39 Tuesday morning, the largest of a sequence of tremors along the rift zone. There is no risk of a tsunami at that magnitude. Deformation is the term used to describe a change in the surface of a volcano, such as swelling, sinking or cracking, which can be caused by movements in the earth’s crust due to motion along faults, according to the U.S. Geological Survey. This is a Civil Defense message for Tuesday morning, May 1, 2018 at 9:30 a.m. 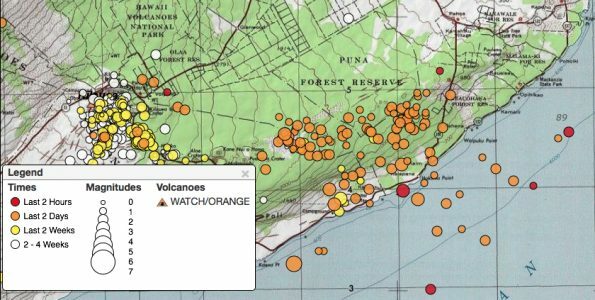 The Hawaiian Volcano Observatory reports increased shallow earthquake activity in the Puna district below Kilauea volcano in the area between Pu’u O’o and Pahoa-Kalapana Road (Route 130). Lower Puna area residents are advised to stay informed by listening to the radio and Civil Defense text alerts and social media sites; this station will be updated. Hawaiian Volcano Observatory and your Hawaii County Civil Defense are continuing to monitor the situation. You will be informed as conditions change. Thank you. This is a Civil Defense message for Tuesday, May 1, 2018, at 6:15 a.m.
Due to the increased seismic activity, lower Puna area residents are advised to stay informed by listening to news media this site will be updated. Hawaiian Volcano Observatory and your Hawaii County Civil Defense are continuing to monitor the situation. You will be informed as conditions change. A collapse of the Puʻu ʻŌʻō crater floor Monday afternoon on Kīlauea Volcano’s East Rift Zone has prompted increases in seismicity and deformation along a large section of the rift zone, with seismicity currently occurring as far as Pahoa-Kalapana Road (Route 130). An outbreak of lava in a new location is one possible outcome. At this time it is not possible to say with certainty if or where such an outbreak may occur, but the area downrift (east) of Puʻu ʻŌʻō is the most likely location, as this is where seismicity and deformation have been concentrated overnight. Between about 2 p.m. to 4:30 p.m. on Monday, April 30, following weeks of uplift and increasing lava levels within the cone, the crater floor at Pu’u ‘Ō’ō on Kīlauea Volcano’s East Rift Zone collapsed.